First, I’m going to give a warning up front. This review will contain spoilers, once I get to the summary and after the jump, so I’ll post my non-spoiler thoughts here to kick off the review. The film is great, not as great as “A New Hope” and “The Empire Strikes Back” since it derives a lot from them, but it is the things that set it apart that really make it an amazing film and easily in the Top 3 films in the Series thus far. Finn and Rey are two of my favorite heroes and Kylo Ren is a great villain (though wasn’t impressed by Snoke or General Hux). The action is fast and our characters are given arcs and there are some really good payoffs, some of which aren’t derivative of the “Original Trilogy.” I’ll get into more detail below, but for these reasons it is really worth seeing. 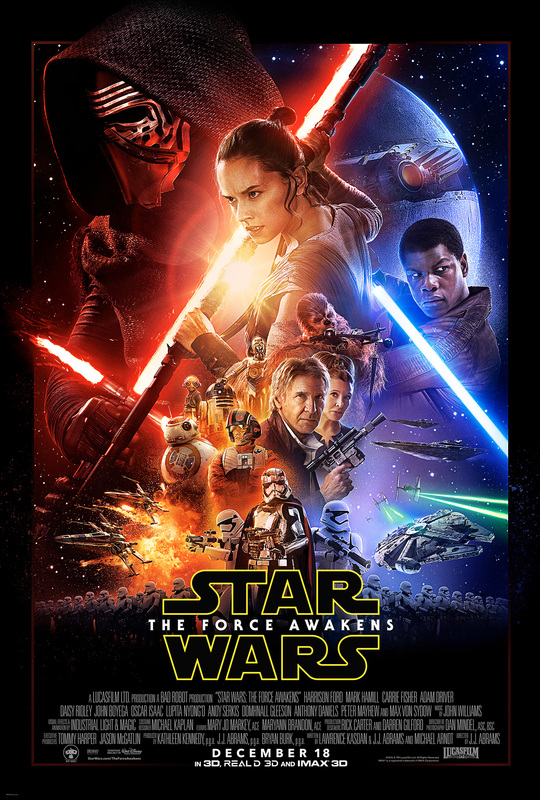 “The Force Awakens” was directed by J.J. Abrams who also one of the writers and producers. The other writers where Lawrence Kasdan and Michael Ardnt while the other producers were Bryan Burk and Kathleen Kennedy. The story takes place 30 years after a “Return of the Jedi” and the First Order has arisen out of the ashes of the Empire. Our new heroes Finn (John Boyega), Rey (Daisy Ridley) and Poe Dameron (Oscar Isaac) must stand together with heroes of old in the Resistance to defeat Kylo Ren (Adam Driver) and the First Order. The Pros: The World – The World is really awesome. We have The New Republic that represents the free world, the Resistance which came about because the First Order came into being and we have Luke having gone into hiding and get to see how the First Order creates Stormtroopers and how their leadership works. It’s really cool and it feels like Star Wars. Jakku is also a really cool world. The Cinematography – The cinematography is amazing! The use CGI and models are blended together seamlessly and the fear or wonder in our characters’ eyes is highlighted beautifully. Dan Mindel really did a great job. The Soundtrack – John Williams is at it again and I really liked his theme for Kylo Ren and his allusions to classic themes with old characters like General Leia or Han Solo. Our new characters have their own themes too and it compliments them on the their journeys. The Characters – The characters, like “The Original Trilogy” are the strongest part of this film, especially when it comes to our new heroes who each are distinct and have their own arcs that I wanted to see and want to see now that the beginning of their arc is done. New Heroes – The new heroes are the strongest part of this film, I enjoyed them much more than the appearance by Luke, Leia, Chewie, Han and R2 and C-3PO. They were fresh and weren’t dependable on referencing past actions as they were making history rather than being a part of living history. BB-8 – BB-8 is adorable and super expressive in how it speaks. I didn’t put R2 or 3PO on this list because they were just small cameos. BB-8 made choices and decisions and grew attached to our new Heroes as well as being Poe’s Droid. They had a really fun relationship. Maz Kanata – Maz is the Yoda analogue of this story as she is 1000 years old, has Luke’s old lightsaber and puts Rey on the path to become a Jedi. She’s really cool and Nupita Nyong’o gives this character so much depth. She has seen so much and her Katina has both First Order agents and Resistance members visiting. I can’t wait to see her character again as she is not a Jedi but she knows the force and it is her training that helps Rey in her fight. Poe Dameron – Oscar Isaac is amazing! His character is smart and mocks Kylo Ren on occasion and shows how he is a good guy when he gives Finn his name and works with Finn to escape. He’s the best pilot in the Resistance and I wish we’d gotten more time with him. He deserves more exploration and was underutilized, though he does get the killing blow on the Starkiller Base. Rey – Rey is the Luke analogue as she is the orphan on the desert planet who will become a Jedi. She like Finn though is always running. She doesn’t begin exploring her force abilities until she has to escape Kylo Ren who is holding her hostage. For this reason her arc is fantastic, she has been alone for so long waiting for her parents it is all she knows and she doesn’t want to leave that comfort. Eventually she does when Ren almost kills Finn and she realizes that it is the only way to defeat the First Order and avenge her mentor who died. She’s a great engineer too and helps the Millennium Falcon work better. Finn – Finn is a former stormtrooper who changes sides after he is part of the assault on Jakku taht kills a Resistance sympathetic vision. It traumatizes him and he commits to helping Poe escape. Sadly he believes Poe to be dead so searches for Poe’s droid BB-8 to get him to the Resistance, which is when he meets Rey who treats him like a human being. They clash but become friends and we see that Finn is still running from his trauma. It isn’t until Kylo Ren captures Rey that chooses to stay with the Resistance and fight to rescue his friend, which leads to him nearly losing his life to Kylo Ren. John Boyega is fantastic. Old Heroes – Our hold heroes make an appearance too! Luke appears at the very end so I’m not mentioning him and 3PO and R2 are glorified cameos and I want to explore the characters who get explored. General Leia – Leia’s story is tragic as we see after her son falls to Dark side her marriage to Han falls apart and she starts up the Resistance again in reaction to the First Order’s rise. She still loves Han and her son Ben and her tragedy continues as Ben seems to be fully given over to the Dark side after he kills his father. What hope Leia has is that Rey will be trained by Luke and maybe through that her son can find the light again. Chewbacca – Poor Chewie! He’s older in this and gets hurt quite a few times from Stormtroopers. Luckily he gets revenge when he and Han set the charges that help lead to the destruction of the Starkiller Base. He also save Finn’s life and help Rey and Finn escape the planet’s destruction. He stays with Rey later too as they form a bond similar to the one he has with Han. Han Solo – This episode is the tragedy of Han as we see that he became a smuggler after his son Ben fell to the Dark Side and destroyed the new Jedi Order Luke was forming. He is running away from Leia and the Resistance but is pulled by in by Rey and Finn and helps them defeat the Starkiller Base, though it costs him his life when Kylo Ren, who is his fallen son Ben Solo, kills him, completing his fall to the Dark Side. Villains – Kylo Ren really. Snoke and Hux felt kind of like jokes. Kylo Ren – Kylo Ren is tragic and powerful and I really like the character. He aspires to be Darth Vader who he idealizes and we see that like Vader he is hand’s on acting as Snoke’s Dragon. He tortures Poe to find out that BB-8 holds the map to Luke and he defeats Finn when Finn tries to stop him at the end. His only loss happens after Chewie shoots him when he kills Han and after Finn injures him. Rey is the one who scars him physically and we see that they will meet again when the planet’s destruction separates them from one another. This episode is him completing his fall as he confesses to Snoke that he feels the light and his killing of his father Han is his distinguishing of it as Ben is fully killed so Kylo Ren can live. Adam Driver is great in this role and made Kylo Ren feel threatening. Rey Versus Kylo Ren – This is the final battle and it is a lot of fun and intense. I thought Rey was overpowered for having no training but the fact that Kylo Ren was physically and emotionally injured and drained helps explain why they were equal and why she was eventually beating him. I want Ren to have his Vader moment, which he hasn’t yet. Rey was also a bit overpowered in this so I hope we see her character better balanced in this future. Han Solo and Kylo Ren – This reveal was powerful, even though I saw it coming the moment Snoke said Han was Ren’s father. So I knew this was coming. Seeing the conflict that Kylo Ren was going through lent power to the character though and made him compelling. Seeing him free in the Dark Side after killing his father was amazing too as it was there that he snapped which contributed to Rey defeating him I think. Okay: Starkiller Base – It is a bigger and badder Death Star that is a planet that was turned into a weapon. It’s Death Star Mark 3, which is derivative and why I’m putting it as okay. It showed lack of creativity on Hux and Snoke’s part for making it. Okay/Con: Death of the New Republic – This would have been stronger if we had spent time with the New Republic. We never did and we don’t know their relationship to the Resistance fully so I didn’t feel the loss. The fact that the system was destroyed should have been more powerful than it felt. The Cons: General Hux – Hux is no Tarkin. Tarkin was effective, respected Darth Vader and his power and when he destroyed Alderaan and had Leia tortured, we felt it. The same can not be said for Hux who got in pissy fits with Kylo Ren and never interacted with our heroes in any meaningful way. Snoke – Sorry Serkis but your big giant alien is less threatening than Palpatine and he was just an old man in the “Original Trilogy” who didn’t do anything except torture Luke with lightning at the end. This character has a long way to go before I can take it seriously. I really hope Snoke is not the actual character’s name, I’m holding out for the Darth Plagueis Theory. Derivativeness – Instead of Alderaan the New Republic System is destroyed, instead of the Death Star the Starkiller Base is destroyed (3rd Time’s the charm? ), BB-8 holds secret plans versus R2-D2 holding secret plans and parental confession on a dangerous catwalk. Now that all of this is out of the way I hope the future episodes can find their own beats not derived from the Original Trilogy. In the end what really keeps this film from being better than “A New Hope” and “The Empire Strikes Back,” is the lack of villain effectiveness. Kylo Ren is the deadliest of them and I could never take General Hux or Snoke seriously. The loss of the New Republic wasn’t felt as we had never been their prior or met the people there, “A New Hope” was stronger since Leia’s diplomatic envoy Darth Vader destroys was an Alderaan ship and crew and we see the loss of life in her eyes and Obi-Wan’s line about hearing the silencing of millions of voices. We don’t feel the loss and that is what sets it below “A New Hope.” The characters make this film worth seeing though, as does the music and special effects. If you like “Star Wars” you should see this. It is a great film and I can’t wait to see how our new heroes’ stories unfold.